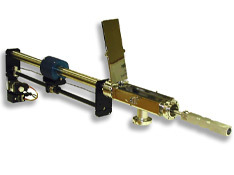 A high-vacuum compatible loadlock system is an efficient, cost-effective method of loading substrates into a vacuum chamber without breaking vacuum. Loading the substrate into an introduction-chamber (loadlock) and evacuating the loadlock prior to transferring the substrate into the main chamber saves a significant amount of time in reaching the required operating pressure. Without repeated venting to atmospheric pressure, the main chamber remains cleaner and dryer. 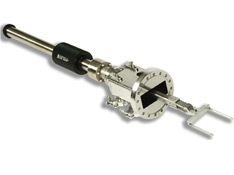 There are many unique magnetically-coupled transfer devices available for sample introduction. 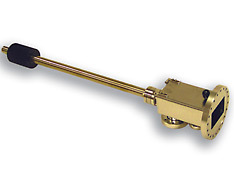 Loadlock chambers can be constructed to a user-specified size with choices of materials, mounting flanges, pump and auxiliary ports, windows or blank-offs and transporters. 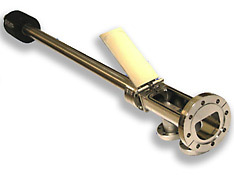 Mounting flanges can be standard CFF, ISO or custom. 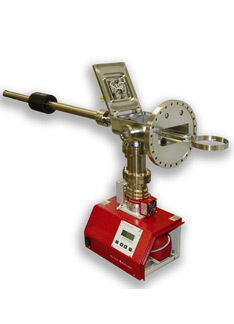 Shown below are examples of a few of the loadlocks provided using various sized CFF mounting flanges. 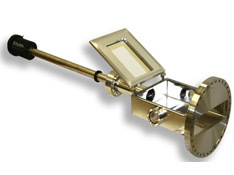 Each system can be ordered as shown or reconfigured to meet your specific requirements. 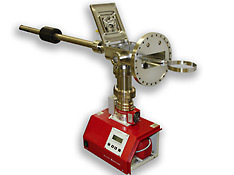 Sample size Sample holder 7" x 1" x 1"
Initial application Introduce samples to perform in-situ spectroscopic ellipsometry of metal films during hydrogen loading and oxidation. Sample size 3" x 3"
Initial application Delivered to an OEM to be added to a MoCVD system for wafer introduction.